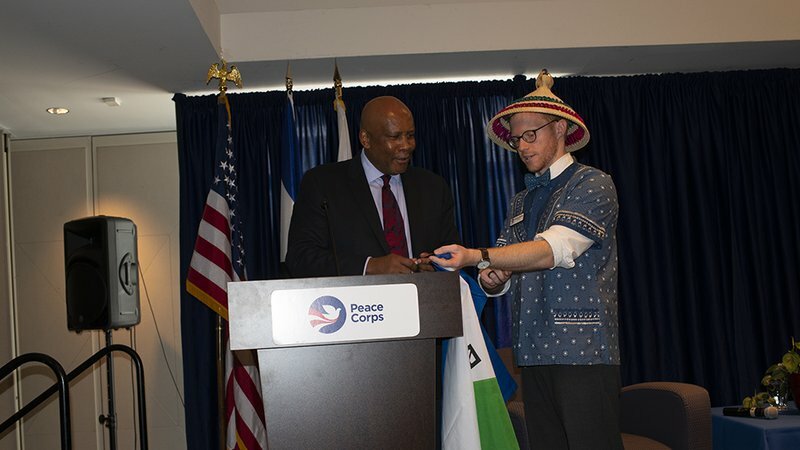 Peace Corps regional recruiter and returned volunteer from Lesotho Matt Merritt meets with King Letsie III after the king's remarks at Peace Corps headquarters. WASHINGTON – His Majesty King Letsie III of the Kingdom of Lesotho delivered remarks at Peace Corps headquarters today, expressing his gratitude for the efforts of Peace Corps volunteers to improve the quality of life in their host communities and build mutual understanding between Americans and the people of Lesotho. His Majesty praised the Peace Corps’ approach to development, placing volunteers in villages around Lesotho for two years of service. His Majesty is known for being an advocate for development, and has committed to firmly place nutrition and food security on both the African and global agenda. While at Peace Corps, he spoke of his interest in developing human capital—a population’s skills, education and capacity—throughout Africa. During a Q&A following the king’s address, Director Jody Olsen asked what Peace Corps volunteers bring back from their service. Also in attendance were Mary Ruppe Nash and Adele Ruppe, daughters of Loret Miller Ruppe. The Loret Miller Ruppe Speakers Series honors the agency’s longest serving director and is a forum for world leaders to speak about issues related to the Peace Corps’ mission, including volunteerism, public service, and international peace and development.